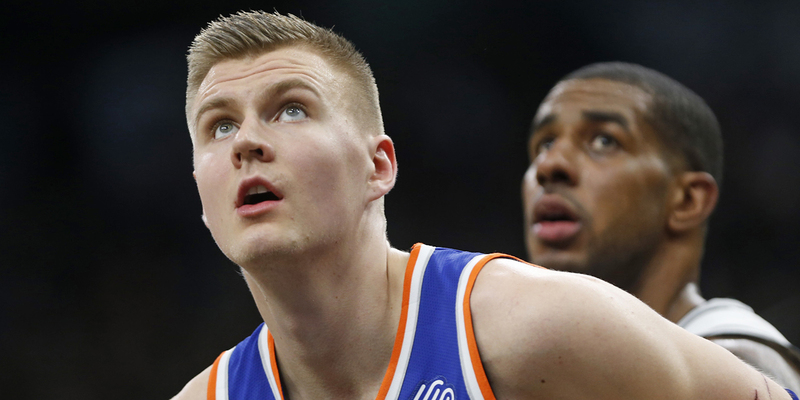 Carmelo Anthony has left the Big Apple and the Knicks are now Kristaps Porzingis' team. But there’s one important way that Porzingis is following in Anthony’s footsteps — and it's not good. I don’t know how to measure it, but it’s always felt to me that the national coverage of young players is heavily influenced by which team they play for. Don a Lakers, Celtics, or Knicks jersey and you’re discussed differently, the spotlight shining a little brighter on your highlights, a little softer on your lowlights. This happens in large part because young players are evaluated not on what they are, but on what they will be. With players who have been in the league for years we have fierce debates — how good they are, how they matter to their teams, how much they drive winning. Think Carmelo Anthony vs. Jae Crowder vs. Andre Iguodala. All the more so for players who aren’t yet fully formed, whose production has to be viewed through the lens of potential. There are certainly young players who strongly distinguish themselves one way or the other, some that leave no doubt they will be a presence in the league for years, some that seem like they’re on the fast track to Europe or the D-League. But the vast majority fall somewhere in between. They make many good plays and many bad plays — if we wanted, we could show clip after clip to make a case either way. Their stats seem to provide little guidance, because current production is mostly beside the point. In that kind of environment, it’s no surprise that hype and fan bias can do a lot to drive narratives. Narratives which have surprising staying power. And it’s worth asking: how much is Kristaps Porzingis part of this? If he was doing the same thing in, say, Denver, or Phoenix or Memphis, would we be still be discussing him as one of the game’s best players? There is a lot to like about Porzingis, of course. The defense. The jumper. The footwork. The fluidity at his size. The ability to shoot over almost any defender. But he also has a glaring flaw, one that doesn’t get enough attention, and one that will be the biggest factor in whether he’s able to make the leap from star to superstar.